It’s the final Kent derby of the season for Whites as Andy Hessenthaler’s men are on the road for one last time this season. Athletic are unbeaten in their seven league matches against sides from the same county this campaign and avoiding defeat on Bank Holiday Monday will extend Dover’s current unbeaten National League run to eight matches. Whites will be up against an Ebbsfleet side with much to play for. Garry Hill’s men are three points behind seventh-placed Eastleigh and anything but a win could end their play-off chances. One Dover player will be familiar with his surroundings upon arrival at the Kuflink Stadium. Midfielder Stuart Lewis featured 67 times for Fleet over two seasons, netting four times. Both Inih Effiong and Mitch Brundle have scored eight National League goals for Dover this season, while Michael Cheek has netted 16 times for Ebbsfleet this campaign. For fans wanting to show the same colours as the players, captain Mitch Brundle and his teammates will be wearing their blue shirts. Two teams in good form meet on Saturday afternoon as visitors Chesterfield make their debut appearance at Crabble. Dover boss Andy Hessenthaler will be aiming for three points to help his side edge closer to National League safety, while a win for manager John Sheridan will ensure the Spireites’ National League status for a second season. Both sides are unbeaten in four National League matches, with Sheridan’s men on a run of three consecutive victories. It’s been a remarkable turnaround for Chesterfield since their reappointment of Sheridan as manager in January, with the Midlands club rising to 14th on the league ladder having been in the bottom four three months ago. Home fans might recognise a familiar face among the visiting squad this weekend. Right-back Bradley Barry had a spell with Athletic earlier this season, making three appearances during his loan in Kent. 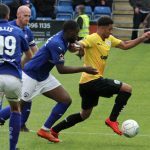 Inih Effiong has scored eight National League goals for Dover this season, while Scott Boden has also netted eight times for Chesterfield this campaign. There is a coach travelling to Barrow on Saturday 13th April and it is not too late to book your space on it! Adult member £40, adult non-member £55, youth member (U18) £20, youth non-member £25 and accompanied under 16 £20. Please call or text Andy on 0793 4300335 to book your seat, or see him in the Centre Spot after the game against Chesterfield. Dover will be looking to continue their National League winning run when they visit promotion-chasing Solihull Moors on Saturday. 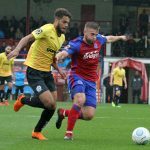 Back-to-back victories against FC Halifax Town and Dagenham & Redbridge has seen Andy Hessenthaler’s men move eight points clear of the relegation zone. Taking three points from Tim Flowers will be no easy task with the Moors on three-match winning streak at the Automated Technology Stadium. One Dover player will be familiar with his surroundings at 3pm. Midfielder Nortei Nortey made three appearances for Solihull during the 2016/17 campaign. 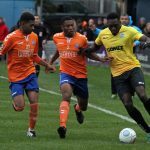 Inih Effiong has scored eight National League goals for Dover this season, while Adi Yussuf has netted 16 times for Moors this campaign. For fans wanting to show the same colours as the players, captain Mitch Brundle and his teammates will be wearing their White shirts. Please call or text Andy on 0793 4300335 to book your seat, or see him in the Centre Spot after the games against Chesterfield. Dover travel to East London tonight aiming to make it back-to-back wins in the National League. Whites moved five points clear of Havant & Waterlooville in 21st place and lie four points below this evening’s opponents, though the Daggers have played one game less. Boss Andy Hessenthaler will be keen to put an end to Dover’s poor record at Dagenham, with Athletic losing six and drawing once in their previous seven visits. Peter Taylor’s men are currently in good form at the Chigwell Construction stadium – with a 2-0 defeat last month against Gateshead their only home defeat this year. Three of the Athletic’s squad will be familiar with their surroundings when they take to the pitch later tonight. 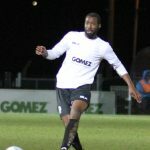 Defender Kevin Lokko made 25 appearances for Dagenham during a loan spell from Stevenage last season, Josh Passley played 38 times matches for Daggers during the 2015/16 campaign and Stuart Lewis features 10 times for the London club in 2010. Inih Effiong has scored eight National League goals for Dover this season, while Connor Wilkinson has netted 11 times for the Daggers this campaign. There is a coach travelling to Solihull on Saturday 30th March and it is not too late to book your space on it! Adult member £27, adult non-member £42, youth member (U18) £13, youth non-member £17 and accompanied under 16 £13. Whites will be looking to extend their unbeaten home run to three matches when they host Jamie Fullarton’s Town on Saturday. Athletic drew 1-1 with Boreham Wood on Tuesday night to add to a 3-0 win against Braintree Town a fortnight ago. However they entertain a team in good form this weekend. The Shaymen are unbeaten in six National League matches, a run that has seen the West Yorkshire side rise to 14th in the division and nine points away from the bottom four. A mean defence has been one of the main reason’s for Halifax’s recent results and they conceded for the first time in just over 450 minutes in their 1-1 draw with Barnet on Tuesday night. Inih Effiong has scored eight National League goals for Dover this season, while Dayle Southwell has netted seven times for Halifax this campaign. There is a coach travelling to Dagenham on Tuesday 23th March and it is not too late to book your space on it! Adult member £27, adult non-member £42, youth member (U18) £13, youth non-member (U18) £17 and accompanied under 16 £13. Please call or text Andy on 0793 4300335 to book your seat, or see him in the Centre Spot after the games against Boreham Wood or Halifax. Dover will be looking to bounce back to winning ways in the National League on Tuesday evening. Having been two goals ahead with twenty minutes remaining on Saturday, Andy Hessenthaler’s men lost 3-2 at Hartlepool. However other results mean Dover are still four points ahead of the relegation zone. 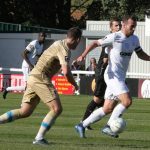 Boreham Wood, four points ahead of Athletic in 17th on the league ladder, have an impressive record at Crabble and have won four of their last six matches at Whites’ home. Luke Garrard’s men recently ended their own recent poor record on the road. 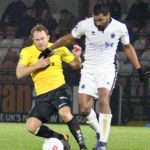 Wood won 2-0 at Bromley earlier this month to end a 12-match winless streak away from home, started after a 4-0 win at Sutton United back in September. Home fans might recognise a couple of familiar faces when Wood arrive at Crabble. Defenders Femi Ilesanmi and Manny Parry were with Athletic last season. 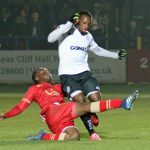 Both players featured in 45 matches each for Dover, with Parry scoring five times and Ilesanmi finding the net twice. 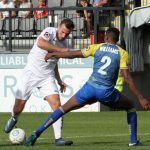 Inih Effiong has scored eight National League goals for Dover this season, while Justin Shaibu and Josh Umerah have netted six times each for Boreham Wood. There is a coach travelling to Dagenham on Saturday 23rd March and it is not too late to book your space on it! Athletic will aim to continue an impressive statistic when they make the 323-mile trip north on Saturday. You see Whites’ have a 100% record against Pool, with Jamie Allen’s first-half goal in August 2017 the difference on Dover’s only ever visit to The Super Six Stadium. Hignett will want to improve Hartlepool’s record of one home win in 2019 – a 2-1 win against Braintree Town on 26th January – his first game of his third spell as Hartlepool boss. And former Middlesbrough and Aberdeen player Hignett added some Premier league experience to his side earlier this week. Canada international David Edgar made a total of 23 appearances in England’s top flight during spells with Newcastle United and Burnley. 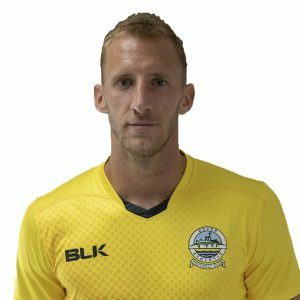 The defender returns to the UK after playing in the United Soccer League for Nashville FC and Ottawa Fury. One of Dover’s management team, a former Premiership player himself, will be familiar with his surroundings this weekend. First team coach Nicky Southall started his professional career at Hartlepool and played 138 times from 1991-95, scoring 24 goals. Inih Effiong has scored eight National League goals for Dover this season, while Liam Noble leads the way for Hartlepool with 13 league strikes so far. Away supporters are situated in the Smith & Graham Stand (also known as the Rink End). This is an all-seated stand which has a maximum capacity of 1,035. There is no terraced area available for away supporters. There is space for 14 wheelchair users within the Smith & Graham Stand. Dover will be looking to start March with a win on Saturday to give their National League survival chances a boost. February was not a good month for Athletic as Andy Hessenthaler’s men suffered three losses in four league games, including back-to-back defeats at Crabble, matches in which Gateshead and Harrogate both scored injury-time winners. Bottom-of-the-table Braintree will arrive in Kent looking to end a poor run of form on their travels. The Iron have not won away in the league since a 4-2 victory at Bromley on 30th October, however will be buoyed by recent home triumphs over Salford (1-0) and Barnet (4-0). Home fans might recognise a familiar face in the visiting squad this weekend. 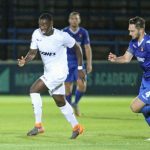 Defender Ejiro Okosieme, who signed for Braintree following his release by Athletic last November, made 16 appearances for Whites during this season and last. 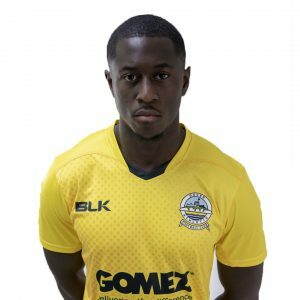 Inih Effiong leads the way for Dover with eight league goals, while Mohamed Bettamer, now at Barnet after signing for the Bees in November, still leads the way for the visitors with six National League goals. West Bromwich Albion loanee Callum Morton is the leading scorer within the current Iron squad with five strikes. There is a coach going to Hartlepool on Saturday 9th March and it’s not too late to book your place on it! Please call or text Andy on 0793 4300335 to book your seat, or see him in the Centre Spot after the game against Braintree.